With only three days left until enforcement of President Donald Trump’s newly revised executive order “Protecting the Nation from Foreign Terrorist Entry into the United States,” Democratic legislators and immigration advocacy groups are rushing to file litigation in opposition of the new order. Although the new executive order has removed some of its controversial provisions, the essential components of the original order have remained the same. For example, the order continues to call for a 90-day travel ban on citizens of Syria, Iran, Libya, Somalia, Sudan, and Yemen who are outside of the United States on March 16, 2017 and who do not possess a valid U.S. visa or permanent resident card as of the date of the order. The order also calls for a travel ban on all refugees and suspension on all decisions for applications for refugee status for 120-days. The new order has now removed Iraq from the list of countries affected by the travel ban and has removed the provision banning the admission of Syrian refugees indefinitely. The language of the newly revised version also makes clear that citizens of these 6 affected countries, who are legal permanent residents or who have valid U.S. visas as of the date of the order, will not be prevented from seeking admission to the United States. Citizens of these countries who do not already have a U.S. visa or green card on the date of the order will not be admitted until the temporary ban has been lifted. In addition, the new order exempts foreign nationals who are admitted into the United States on or after March 16, 2017, as well as dual nationals traveling on a passport issued by an unaffected country, and individuals traveling on diplomatic visas. The order also carves out a provision that allows qualifying individuals to apply for a waiver if they can demonstrate to the satisfaction of the US official that their country would cause them undue hardship or that that they are not a threat to national security, and that their admittance is in the national interest. It seems however that these waivers will be rarely issued and difficult to obtain, unless the U.S. official determines that the foreign national’s admittance is in the national interest. On Wednesday March 15, 2017, the day before the new travel ban is expected to be enforced, a federal judge from the state of Maryland and a federal judge from the state of Hawaii will hear arguments in opposition of the new travel ban giving affected foreign nationals the opportunity to once again block the order. These hearings are important because they will set the stage for how the judicial system will respond to the new executive order as opposed to the original version, before it is implemented. In addition, the state of Washington which successfully blocked President Trump’s original executive order, has requested a federal judge in Seattle to block the new executive order based on the judge’s ruling against the original order. The Attorney General for the state of Maryland Brian Frosh has stated that he will join Washington state’s lawsuit. 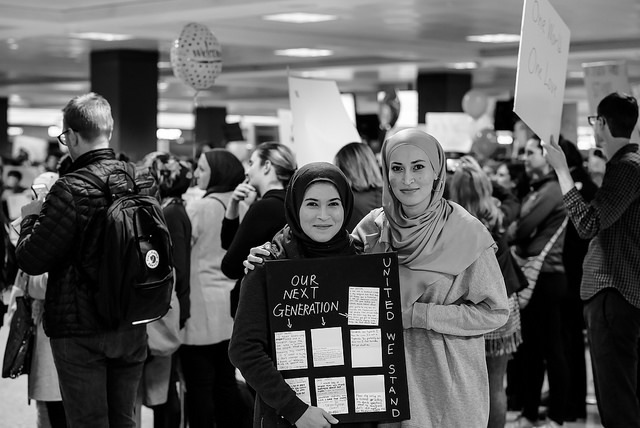 Other nonprofit groups such as the American Civil Liberties Union and the International Refugee Assistance Project have geared up in opposition of the new order, filing their own suits to block the travel ban from taking effect on March 16th. Lawyers for the ACLU have stated that they are seeking an injunction to stop the new executive order from being enforced. They hope that the Seattle judge will continue the injunction, to prevent further litigation. On March 10, 2017 eight U.S. Senators issued a letter to the President voicing their opposition to the new travel ban which in their view undercuts American values. In addition, 50 presidents from leading universities across the United States including Harvard, Princeton, Columbia, and Yale sent Trump a similar letter urging him to rescind the order. Please remember that even though lawsuits will continue to be filed nationwide in opposition of this order, the order at this time will be enforced on March 16, 2017 at 12:01 a.m. eastern time. If you are outside of the United States on or after March 16, 2017 and you do not have a valid U.S. visa or permanent resident card, and you are a citizen of Syria, Iran, Libya, Somalia, Sudan, and Yemen you may not seek admission to the United States for 90-days. More updates will be provided as they become available.